Track editor 'edit controls' now work live. The Apply button is removed, and all changes are applied immediately. You can see the result in the editor, and you can hear it if transport is running. The editor's Undo button can of course be used to undo the changes if necessary. It also applies to the corresponding windows for single or multiple selected notes, and to automation and MIDI controller editors. There are several other 'edit control'-related improvements. Mixer section knobs, faders and mute/solo buttons can now we used while an editor or 'edit control' window is visible (without hiding this window). 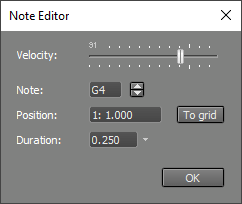 Note velocity editor: mouse moves are now applied immediately, so you can hear the result before releasing the mouse button. 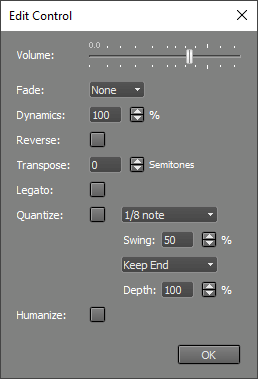 Quantize 'swing' options are now separate controls (this makes tweaking it 'live' easier). MIDI editors: New 'Duration only' quantization type. The existing 'Full' en 'Keep Note Off' types have been renamed to 'Start and End' en 'Keep End'. 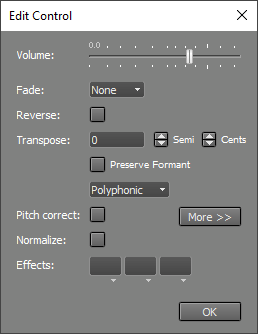 MIDI editors: Quantize resolution selector menu now has 'Type value' option which allows for entering tuplets. You can type '5 in 1/4' to quantize to quintuplets of 16th for example. The graph now has 6 colored dots, corresponding to the 6 EQ bands. The dots can be moved (the corresponding frequency and gain knobs will be adjusted accordingly). Dot movements can be recorded as automation (Pro edition). 'No bands' spectrum looks nicer. The graph can now display a reference spectrum. A standard one is built-in, and you can extract the spectrum from audio files. This feature replaces the 'flat mastering' option. The Devices window, with the 'Select Devices' button, is removed. You now go straight to the former 'Select Devices' window. This makes changing devices easier and quicker. The info that was displayed in the Devices window now appears on hovering the Devices menu item. Another devices related improvement: a helpful message now appears if audio recording isn't possible because of Windows 10 privacy settings. 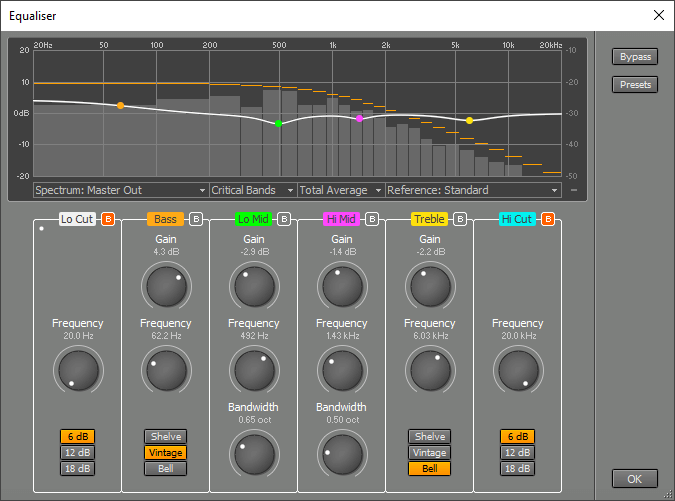 Master Limiter / Noise Gate: histogram 'curtain' movements can be recorded as automation (Pro edition). 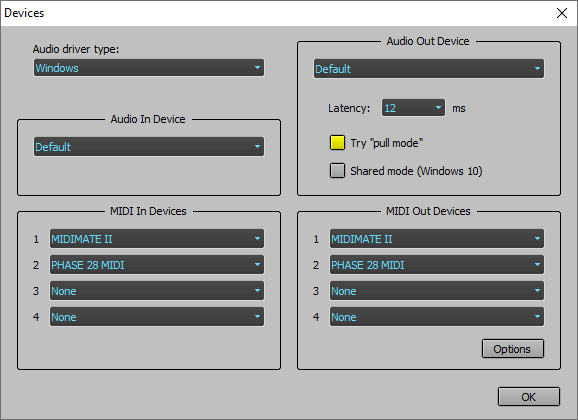 External MIDI Instrument windows: Patchmap selection is moved to options menu ('hamburger' button). 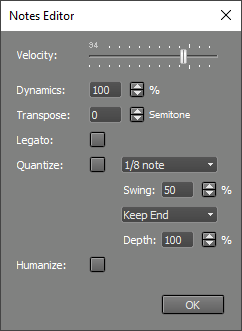 The default patchmap can be selected there as well (it was in the MIDI Out Options window). Multi Instrument: option to switch between Layered and Articulation modes is now easier to discover. Mac: SoundFont Player has better support for soundfonts with very large release times (like 'GeneralUser GS'). You need to import the soundfont again to benefit from the improvements. Fixed some issues that caused exception errors (and hence error reports being sent).